"This yummy bread was taught to me by the best cooks in the world, the Allora family. It is perfect for potluck, or any party. Trust me, this bread will become your most requested dish." Roll the dough into an 10-inch square on a well-floured surface. Arrange half of the pepperoni over top, and sprinkle evenly with half of the mozzarella cheese. Arrange the remaining pepperoni over the cheese, and sprinkle with remaining cheese. Fold the left third of the dough over the middle third, then fold the right third on top of that. Fold the top and bottom ends over the bread so the edges meet in the center. Drizzle the bread with olive oil, and place seam-side-down onto a nonstick baking sheet. Bake in the preheated oven until the bread is golden brown and crusty, 15 to 20 minutes. Cool before slicing. What's cooking in Charlotte? Suzi's versatile potluck pepperoni bread. 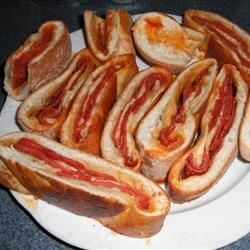 Everyone makes their own style of pepperoni bread. I like to double up on my pepperoni. Folding it this way allows me to slice it like a loaf and then possible again down the middle for smaller bite size pieces for kids. If you would prefer low in fat, use turkey pepperoni. If you are a vegetarian, you can swap out the pepperoni for spinach. I found this to be a little lacking in flavor, even though I put the olive oil on the dough prior to layering and sprinkled chopped garlic and a little oregano. Excellent. Everyone loved it. Added Italian Seasoning to the cheese and sprinkled parmesan cheese on the top before baking. I tried this and it was WONDERFUL! My family loved it!! This was really good. I added a little bit of sauce, Italian seasoning and some parmesan. Very easy to make and very quick. It was a little greasy so it might be better to use turkey pepperoni. This was gone so fast. Rolled it up jelly roll style. I will be making this again! I made this New Year's Eve and it must have been really good because I didn't even get to sample it. Hubby raved about it.